Our focus in the Senate has been on ratepayers first. We have to protect their interests and their money. This is highly complex and complicated issue that cannot be simplified to a catch phrase, news headline, or campaign slogan. Any decision made will impact customers’ rates both presently and long into the future, will affect the standing of a large South Carolina employer, will disturb capital market trading and investment activities, will influence future capital investment in South Carolina; and no matter what decision is ultimately made will almost certainly result in a lawsuit. It is our hope in the Senate to shoot straight because more than anything, customers do not want to be told they are getting something only to find out that has changed…you have experienced enough of that. 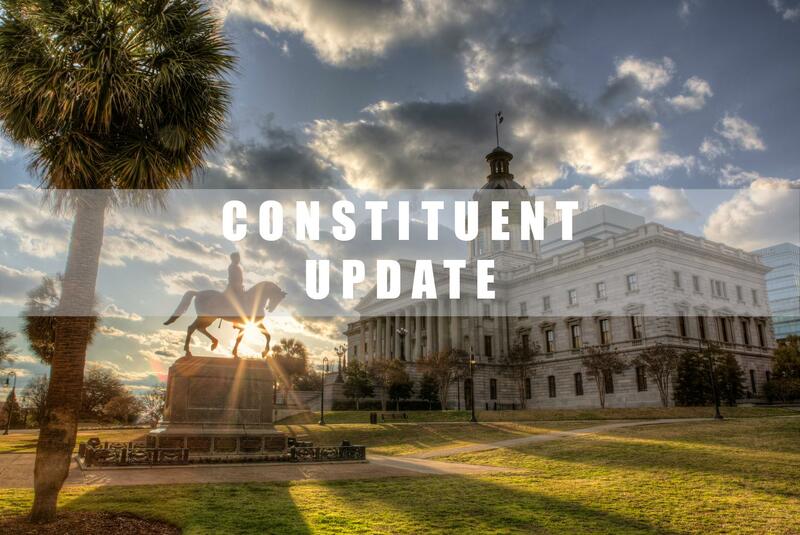 The FY18-19 General Fund appropriations bill remains in Conference Committee working on differences between the House and Senate versions. Here are a few things being considered. Tax Conformity - Each year, SC must make the decision whether or not to conform with federal tax law. The process is typically routine. This year, with the changes to federal tax law, the decision is not so clear cut. You can read more on this issue HERE. Analysis of Teachers Duties – An amendment to relieve teachers of burdensome tasks that interfere with their ability to teach. The budget proviso requires the Department of Education to conduct a bottom-up analysis of the tasks of teachers in South Carolina to determine what duties placed on teachers are unnecessary or may be consolidated to other functions, or be performed by another staff position. Our teachers are asked to do a lot including administrative duties outside the classroom. We must get back-to-the-basics in providing a high quality education for students in the classroom. This budget proviso puts us on the right path forward to see that our teachers able to focus on what we ask them to do…teach our children. Tuition Transparency – The tuition transparency amendment requires public universities to post where, and for what purpose, tuition goes that exceeds the amount required to fund classroom costs for a program. Saying Thanks To Teachers – A teacher can make one of the greatest impacts on a child’s life. The Senate budget recognizes the dedication that teachers give in the classroom by providing adding an additional $2,000 to the starting salary of a K-12 teacher in the public system, a 1% raise, and complete funding of step increases. More needs to be done. Retiring Rolling Firebombs – Outdated school buses, particularly a model prone to fires, have jeopardized the safety of our children for far too long. The Senate budget rids our school districts of these “rolling fire bombs” and the danger they present our students. The Senate budget also increases the base student cost paid to local school districts and includes over a $10 million increase for Need Based grants for Higher Education, the largest increase since the FY1999-2000 budget. The House version of the budget provided no increase. This year’s budget is a positive step forward for educational opportunities in South Carolina, prioritizing the critical needs of education and the importance of our teachers, parental involvement and students’ ability to learn in the classroom. Responding To Our First Responders — Our state has been impacted by several natural disasters in the last few years. We thank our law enforcement, DNR and other first responders who gave assistance during these tragedies. The FY18-19 budget includes additional salary to those responders who assist in preventing the spread of forest fires. The Senate additionally made an impactful investment to provide for additional SLED agents to reduce case loads, increased trooper pay, Department of Corrections officer pay increase, community specialists for the Department of Juvenile Justice and providing the needed resources to see that our officers are trained and protected in the growing concern of mental health situations and PTSD therapy. Opioid Prevention Assistance – The opioid epidemic is ripping apart families and communities nationwide, and our state is not immune from its impacts. We are committed to stopping abuse of dangerous controlled substances. This year’s budget includes an additional $11M for opioid abuse prevention and treatment programs. Ratepayers First — The Senate also passed an amendment to have the Public Service Commission order regulated utilities to pass along the full tax benefits received from the Trump Administration’s Tax Cuts and Jobs Act wholly to electric customers. We don’t need to try to fool customers about reductions in rates resulting from an Act passed by Congress. By estimates, these utilities will receive large amounts in tax relief under the federal tax plan. We, in the Senate, believe those benefits ought to go directly to customers to provide immediate rate relief. Those Who Serve Our State — Our front line state employees are crucial to seeing that the everyday services provided to South Carolinians are reliable, efficient, and performed with a friendly face. The Senate budget recognizes the importance of those who have chosen to serve the state by providing a $500 bonus to state employees who have been employed at least six months and make less than $50,000. Putting South Carolina Back To Work — Our economy is strong and workforce is growing. We want to see that working South Carolinians are lifted out of poverty and have the opportunities to better their lives and provide for their families. The Senate budget ensures that SNAP benefits are available and accessible to those who truly need them.